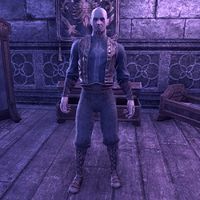 Baron Wylon Montclair is a Breton vampire and the patriarch of House Montclair, one of the three main houses in the region of Rivenspire. He is the widower of Baroness Leila Montclair and the father of Lleraya Montclair. I swore I would never ask this of you. It goes against everything I believe in. But damn it, she's my wife! I don't want to lose her." "I know, I know. You swore an oath. No one should ever have to endure the things you've gone through because of what you are. But you're alive! That's more than my wife will be if you don't help her." She deserves a better fate than becoming a vampire. During the next memory, the Baron is celebrating "Verandis's" cure for his wife's ailments. "This will work, my old friend. We're going to save Leila, I just know it!" "These animated bones—why do they seek to keep us from the relic? Are they the lingering remains of the Ayleids who once dwelled here, do you think? Well, they won't stop me. No matter what their reasons are, my cause is greater." Are you sure you want to go through with this, Wylon? "I have never been more sure of anything in my life, Verandis. I will sacrifice everything, risk anything, to save the woman I love. A shame the same can't be said of all of us." I only did what Leila asked. She was worried about you! "You did what Leila wanted? What about what I wanted? You allowed her to talk you out of it when I expressly asked you to turn her! Well, I'm done asking. We're here because of you, and we're going to do exactly as I say. We're going to save my wife." "Sorry won't help us here. We have to find the Ayled relic. That's all that matters now. Just remember, we're out of options. This is our last chance to save Leila and I won't let you ruin it, vampire!" Baron Wylon Montclair: "What a magnificent structure! The relic this monolith houses must be powerful indeed!" Baroness Leila Montclair: "Wylon, my love, I'm afraid." Baron Wylon Montclair: "Hurry, Leila. Trust me. Soon you will be healed and we can put this terrible episode behind us." Baron Wylon Montclair: "This is it. The relic is just beyond this door!" "We've done it! We've reached the top of the Doomcrag! Now we can finally learn the secret of the ancient Ayleid relic and save my wife." I can sense the power of this relic. It doesn't feel particularly benign to me. "Your fear colors your perception, Verandis. It is merely the pulse of ancient magicka, the heartbeat of a powerful relic. Our intentions are pure. We seek only to save my beloved's life. These creatures have no reason to stop us." Wylon, we need to be cautious. Something isn't right here. "Has your courage deserted you, vampire? You discovered the relic's resting place, and I thank you for that. But right now we have to reach the relic chamber and save my wife. After that, you can do what you want. Now let's go." "By the Eight! Can you feel the relic's power, Verandis?" This power. Something about it feels wrong to me. "Enough of your constant mewling, Verandis! Are you a vampire or a scullery maid? This is exactly what we've been looking for! You told me yourself. The Ayleid texts referred to the latta—the light. This is it. This is what will cure Leila." We never learned why the Ayleids hid this relic within this desolate tower. "We don't know why the Ayleids did a lot of things. They were a strange people. But that won't stop us. Stand back and watch, for all I care. But we're going to save my wife! I'll risk my life—my very soul—to help my dear Leila. Now, let's begin." Baron Wylon Montclair: "Have no fear, my darling Leila. Soon the light will wash away your pain." Reezal-Jul: "It's going to work, Baron. 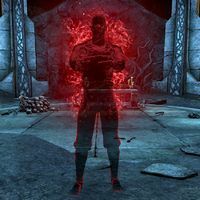 The power of this ancient Ayleid remnant... it's almost overwhelming." Lleraya: "You're going to be all right, Mother. Just hold on." Baron Wylon Montclair: ""The remnant will make you like new, my love! You'll be reborn! Lleraya: "Something's... happening. I feel... the power!" Baroness Leila Montclair: "Wylon! Something feels... wrong ...."
Baron Wylon Montclair: "Verandis, we need you! We need your power! Quickly! Touch the relic and help us!" As the Baron begins to chant, the Baroness begins to shiver and twitch. Baron Wylon Montclair: "Anyamis alata! Malatua latta mitta jorane mori!" Baron Wylon Montclair: "Vasha anya belda sancre!" Lleraya: "Father... what... what's happening to us?" Reezal-Jul: "It's working! It's working! Soon the power will be ours to command!" With Verandis having touched the remnant, the Montclairs are turned into vampires. Leila is in immense pain. Baroness Leila Montclair: "No! What... what have you done? This isn't me! I... I never wanted this!" Baroness Leila Montclair: "Please, Verandis. Help me! Make it stop! I... I can't stand the pain." Baroness Leila Montclair: "End this, Verandis! End this before I... arrgh!" Verandis slays the Baroness to end her pain, but it's not over yet. Baron Wylon Montclair: "No! Verandis! What did you do to Leila? What did you do?" Baron Wylon Montclair: "You'll pay for that, vampire! I have the power now. Nothing can stop me from reaching out and snapping ...."
Gwendis: "Verandis? Montclair, no! Come on, Verandis, we need to get out of here!" The Baron appears during your climb up the Doomcrag. Baron Wylon Montclair: "I'll make you pay for taking my daughter's life!" Baron Wylon Montclair: "Let the power of the Remnant wash over you!" Baron Wylon Montclair: "The Remnant and I are one! Its power flows through me!" Baron Wylon Montclair: "These mortal trappings mean nothing! There is no hope for any of you!" Baron Wylon Montclair: "You have ended me but doomed Rivenspire! Let the power of the Remnant burst free!" This page was last modified on 3 March 2019, at 04:00.